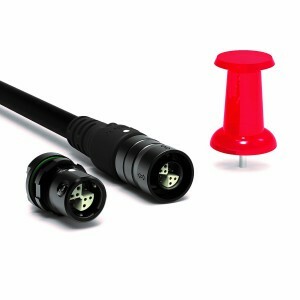 Fischer Connectors launched an even smaller ultra-miniature connector, MiniMax 06, as an extension of its miniature high-density product range, the Fischer MiniMaxTM Series. With this new smaller connector, Fischer Connectors continues to drive the evolution towards combined signal and power connectors as a way of making electronics lighter and smaller. MiniMax 06 integrates fully into the ultra-miniature high-performance Fischer MiniMaxTM Series, well-known for its use in limited space and lightweight applications, and for meeting the combined needs of multiple signals and power. Tested for high-speed protocols such as HDMI and data transfer up to 10Gb/s, the series also addresses the growing market need for higher data transmission rates. The Fischer MiniMaxTM Series connectors and cable assembly solutions allow design engineers to save up to 45% space and to reduce weight by up to 75% compared to standard connectors with a similar contact size. By replacing multiple connectors with only one, they pack more functionality into smaller devices, lowering the total cost of ownership. With its new smaller version, the Fischer MiniMaxTM Series now comes in two sizes, 06 and 08, with receptacles of 10 mm and 12 mm footprint respectively. Configurations range from 2 signal and 2 power connections up to 20 signal and 4 power connections. The MiniMax 06 connector will be showcased for the first time at XPONENTIAL, the tradeshow organized by the Association for Unmanned Vehicle Systems International (AUVSI) in New Orleans from 2 to 5 May 2016, at Fischer Connectors’ booth no. 1308. It will be commercially available this summer.